A low-sodium (salt) diet contributes to a healthy heart. Did you know that the majority of the sodium you eat -as much as 75% comes from packages of processed, prepared foods? 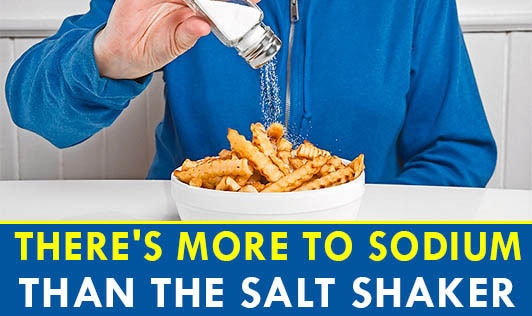 Even foods that don't taste salty often contain large amounts of sodium. 1. Buy fresh, frozen, or canned "with no salt added" vegetables. Use fresh poultry, fish, and lean meat, rather than canned or processed types. 2. Rinse canned foods, such as tuna, to remove some sodium. 3. Use herbs, spices, and lemon juice in cooking and at the table. 4. Cook with "Low-Sodium*" salt (use it sparingly). Choose "convenience" foods that are lower in sodium. Cut back pizza, packaged mixes, canned soups or broths, and salad dressings. These often have a lot of sodium .Buy low- or reduced-sodium, or no-salt-added "convenience" foods. 5. Read ingredient labels. There are many names for salt: sodium chloride, sodium bicarbonate, sodium benzoate, monosodium glutamate (MSG), sodium nitrate, and disodium. *Note: People on potassium restricted diets should avoid "Low-sodium" salts.